I am desperate for expert advice. 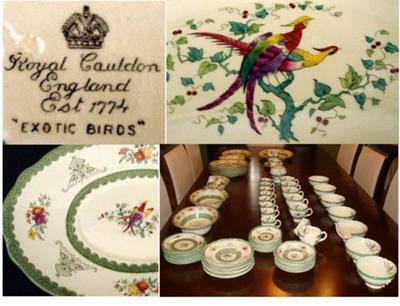 I won a lot of this beautiful pattern on eBay, Royal Cauldon "Exotic Birds" (green). I cannot find it anywhere or anyone who knows anything about the pattern. There are ORANGE plates in this pattern for sell on eBay but mine are a lovely green not orange. I will be happy to send you a picture. I really would love ANY information on this pattern and any tips on where I can find some replacement pieces. I have searched and searched for over a year now and still no luck. It is beautiful, old, and I am in love with the pattern. Thank you in advance for ANY help you may be able to provide. Great query! Thanks for submitting it. I like Cauldon ware. They are a company with a very rich and detailed history - it was a shame they were later taken over by Pountey Potteries who showed bad judgment in significant areas and went bust. I have some Cauldon myself. 1. Have you seen my China Replacement Guide? 2. Did you find the Cauldon listing in my China Manufacturers A to Z guide under 'C'? Or the Ridgway Potteries listing? Thanks for responding so fast to my request. I really appreciate it and your site is fantastic. It is the best I have I come across. During the search for my pattern, I have read about the potteries' history and indeed what Ridgway once gloriously started went out with such a sad fizzle. I did read your manufacturing guide on Cauldon and Ridgway and I also read your china replacement information. I have registered with China Replacements, China Search UK, China Finders and have emailed a few collectors for advice and help to no avail. I also feel like I have exhausted my search on eBay. I have just about given up and only check now sporadically. Any help you can lend at this point is a dream come true. here's one other thing to try. On my China Replacement page there are instructions on how to save a search on ebay (they will email you automatically). Be sure to do that. I think you will be sure to eventually find items with this pattern using this system if you are patient and methodical. Secondly, you need to go to US site Replacements.com & register. Thanks for all the wonderful advice and I will definitely be using your techniques to search on eBay. I will go back and read that information on your site thoroughly. I had a feeling this pattern was going to be hard to find. You would not believe how many pieces came in the lot but it was poorly packaged when shipped to me and several pieces were broken and so was my heart. I'll attach another picture of it all for you. Actually. the listing on Replacements.com is mine (I called them China Replacements earlier - I see by your website review they are two different companies). That is the photo I sent them when I registered the pattern in my search to find more and I update my information with them regularly but no hits yet but hopefully some day. Please keep it up because as I stated before, your site is the best I have come across and your rapid and enthusiastic response has been the enormous comfort and just the boost I needed to continue my search. You will be the first to know when I find this beautiful Cauldon ware! PS: From my own files, I happen to know the backstamp shown was used between c.1930 and c.1950, so your set is quite old. Many thanks for publishing these notes. They are a great help in the finding of china using the latest technologies online.